In an effort to be inclusive in this post, I will refer to a spiritual practice rather than a religion so that we can all relate. And if you don’t believe in these things, that’s OK too. If you have a spiritual practice, you may or may not have a day of the week and a location in which to practice or learn more about your beliefs. That is all well and good, but in my mind, a spiritual practice and the actual embodiment of your beliefs should be an every day thing, a normal and simple part of your life. Think about your own spiritual practice. Is it a part of your day to day life? Do you need books, tools, or other things in order to feel as though you are connecting to your source? Those of us with ADHD have so many, many thoughts running through our heads. It’s easy to become overwhelmed and from there, to becoming anxious, worried, or depressed. It’s sometimes hard for us to remember that there is a higher source that we can turn to in times of need. Or anytime, really. There is a thing in the ADHD community that you may or may not be aware of; it’s called a fidget. Basically, a fidget is a small, unobtrusive object that you can fiddle with when you’re feeling anxious or have excess energy. They are especially useful for kids in school. I think that we could adopt this idea to help remind us of our spiritual beliefs. I have a few friends who have lost loved ones and had a small part of their cremains enclosed within a charm that they wear around their neck. It’s an easy thing to just touch the necklace when they’re feeling low. A woman in our neighborhood passes out bracelets with the saints on them to those that she feels need them. She started this practice after she lost her husband. And of course there are crosses and rosaries. I’ve always been fascinated by worry beads. It sounds like just the thing I need when I’m stressing too much. I had an aunt who was an avid rock hunter. She and her husband would take trips to dig for stones and then come home, polish them, and sometimes make jewelry out of them. I inherited them when she passed away. I collect rocks myself, just based on how they look. Anyway, some of the stones had just the right feel to them; smooth and polished, with a gentle curvature to fit your thumb or finger. I would often carry one in my pocket just to play with when I was feeling tense. 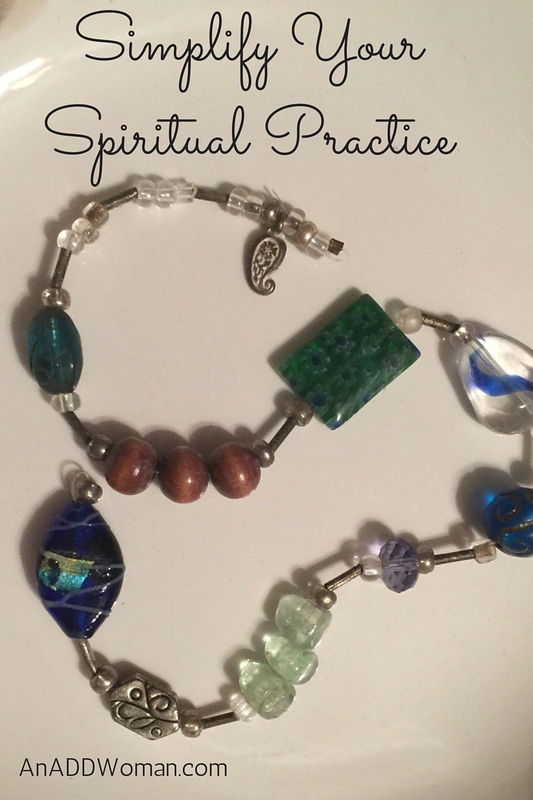 You may wonder what the connection is to playing with a stone or some worry beads and a spiritual practice. To me, they are simple tools that help me stop, be still, and connect. Because I don’t think that you can truly connect to your source unless you are still.